Contae Aontroma is the Irish name; Coontie Antrìm, Countie Antrim, Coontie Anthrim and Coonty Entrim are Ulster-Scots names. County Antrim is one of the six counties of Northern Ireland. It is in the province of Ulster. It is named after its former county town, Antrim. The name comes from the Irish Aontroim which means "lone ridge". 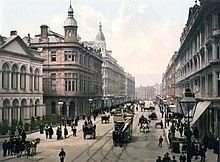 The largest part of the capital city of Northern Ireland, Belfast, is also in County Antrim. The rest of Belfast is in County Down. A large part of Antrim is very hilly. The highest hills are in the east of the county. The mountain range runs north and south, and, following this direction the highest points are Knocklayd 514 m (1,690 ft), Slieveanorra 508 m (1,670 ft), Trostan 550 m (1,800 ft), Slemish 437 m (1,430 ft), Agnew's Hill 474 m (1,560 ft) and Divis 478 m (1,570 ft). Along the coast there are a lot of cliffs in the north. Some of the most remarkable cliffs are those formed of vertical basaltic columns, like at the Giant's Causeway. 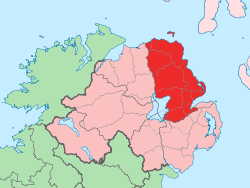 The only large island of County Antrim is L-shaped Rathlin Island, off Ballycastle, 11 km (6.8 mi) in total length by 2 km (1.2 mi) maximum breadth, 7 km (4.3 mi) from the coast. The river Bann and the river Lagan are the two important rivers in the county. The fisheries of the Bann and of Lough Neagh (especially for salmon and eels) are of value both commercially and to sportsmen. The county borders Lough Neagh. Belfast International Airport is in County Antrim. It is Northern Ireland's main airport. There are regular flights to Great Britain, Europe and North America. The other airport in the area, George Best Belfast City Airport, lies a mile east of Belfast city centre on the County Down side of the city. Two of Northern Ireland's main ports are in County Antrim, Larne and Belfast. The Port of Belfast is Northern Ireland's main port. It is a major centre of industry and commerce and has become established as the focus of logistics activity for Northern Ireland. Around two thirds of Northern Ireland's seaborne trade, and a quarter of that for Ireland as a whole, is handled at the port which receives over 6,000 vessels each year. Statistics for 2009-2010 show 1,832 students attending the 12 Gaelscoileanna (Irish language primary schools) and 1 Gaelcholáiste (Irish language secondary school). The Presbyterian Church in Ireland is the largest religious denomination, followed by the Catholic Church and the Church of Ireland. County Antrim is one of two counties in Ireland in which most of people are Protestant, according to the 2001 census, the other being Down. The strong Presbyterian presence in the county is mostly because of the county's historical links with lowland Scotland. It is unknown when the county of Antrim was formed. It was the name of a district in the early 14th century, before Edward II was king. The earliest known people to live here were Mesolithic hunter-gatherers of pre-Celtic origin,. In ancient times, a Celtic people called the Darini lived in Antrim. In the early Middle Ages, southern County Antrim was part of the Kingdom of Ulidia. It was ruled by the Dál Fiatach clans Keenan and MacDonlevy/McDunlavey. The north was part of Dál Riada, which stretched into what is now western Scotland over the Irish Sea. Dál Riada was ruled by the O'Lynch clan. The Dál nAraide and the Cruthin, who were pre-Gaelic Celts and probably related to the Picts of Britain lived in lower County Antrim. Between the 8th and 11th centuries there were Vikings in Antrim too. In the late 12th century Antrim became part of the Earldom of Ulster, won by Anglo-Norman invaders. Edward Bruce fought to restore local, Gaelic, government in 1315. 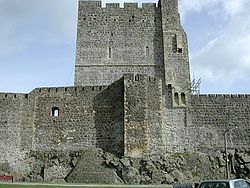 It left Carrickfergus as the only significant English stronghold. In the late Middle Ages, Antrim was divided into three parts: northern Clandeboye, the Glynnes and the Route. The Cambro-Norman MacQuillans were powerful in the Route. A branch of the O'Neills of Tyrone migrated to Clandeboye in the 14th century, and ruled it for a time. Their family was called O'Neill Clannaboy. A Gallowglass sept, the MacDonnells, became the most powerful in the Glynnes in the 15th century. During the Tudor era (16th century) numerous adventurers from Britain wanted to come and live in the region. Many Scots settled in Antrim around this time. In 1588 the Antrim coast was the scene of one of the 24 wrecks of the Spanish Armada in Ireland. The Spanish vessel La Girona was wrecked off Lacana Point, Giant's Causeway in 1588 with the loss of nearly 1,300 lives. The historical monuments of the county consist of cairns, mounts or forts, remains of religious and military structures, and round towers. There are three round towers: one at Antrim, one at Armoy, and one on Ram's Island in Lough Neagh. There are some remains of the religious establishments at Bonamargy, where the earls of Antrim are buried, Kells, Glenarm, Glynn, Muckamore and Whiteabbey. Carrickfergus Castle, dating from the Norman invasion of Ireland is a well preserved medieval structure. 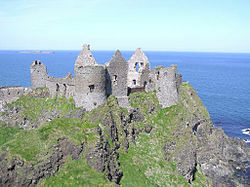 There are, however, remains of other ancient castles, as Olderfleet, Cam's, Shane's, Glenarm, Garron Tower, Red Bay, and Dunluce Castle, notable for its dramatic location on a rocky hill. Slemish, about eight miles (13 km) east of Ballymena, is where St Patrick's lived when he was young. According to tradition Saint Patrick was a slave for seven years, near the hill of Slemish, until he escaped back to Great Britain. Linen manufacturing was previously an important industry in the County. At the time Ireland produced a large amount of flax. Cotton-spinning by jennies was first introduced to Belfast by industrialists Robert Joy and Thomas M'Cabe in 1777; and twenty-three years later it was estimated that more than 27,000 people were employed in the industry within ten miles (16 km) of Belfast. John O'Kane Murray, (1847–1885), born in Antrim, physician and noted author. ↑ Postal Towns/Bailte Poist, Northern Ireland Place-name Project. Queen's University Belfast. Retrieved 8 March 2012. ↑ "Mountain Views". Simon Stewart. Retrieved 2010-08-30. ↑ Waddell, John (1998). The Prehistoric Archaeology of Ireland. Galway: Galway University Press Limited. pp. 11–24. ↑ O'Rahilly, Thomas F. (1946). Early Irish History and Mythology. Dublin: Dublin Institute for Advanced Studies. p. 7. ↑ O'Rahilly, Thomas F. (1946). Early Irish History and Mythology. Dublin: Dublin Institute for Advanced Studies. pp. 341–352. ↑ Benn, George (1877). A History of the Town of Belfast. Belfast: Marcus Ward & Company. pp. 21 ff. ; Encyclopaedia Britannica (14th edition), Antrim. ↑ "La Girona" (PDF). # Annual Report of the Advisory Committee on Historic Wrecks, 2005. Advisory Committee on Historic Wreck Sites. p. 35. Retrieved 2008-11-01. ↑ 14.0 14.1 14.2 Who Was Who in America, Historical Volume, 1607-1896. Chicago: Marquis Who's Who. 1967. Wikimedia Commons has media related to County Antrim. This page was last changed on 28 June 2018, at 00:06.